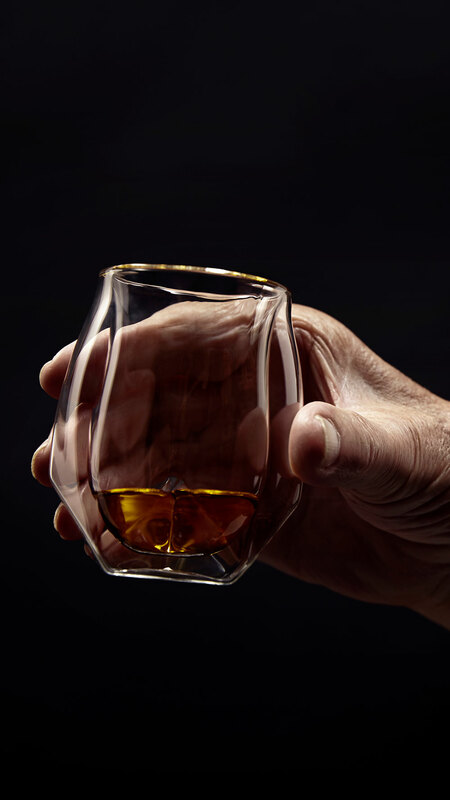 The Norlan Whisky Glass is a transparent double walled vessel, formed with glass blowing technique into two separate two-part molds: one for the inner wall, and one for the outer wall. When the inner and outer glass walls are prepared, the rims are reheated and the inner glass is inserted, at which time the rims are sealed. This creates a hollow body glass with dramatically different inside shape to outside shape. 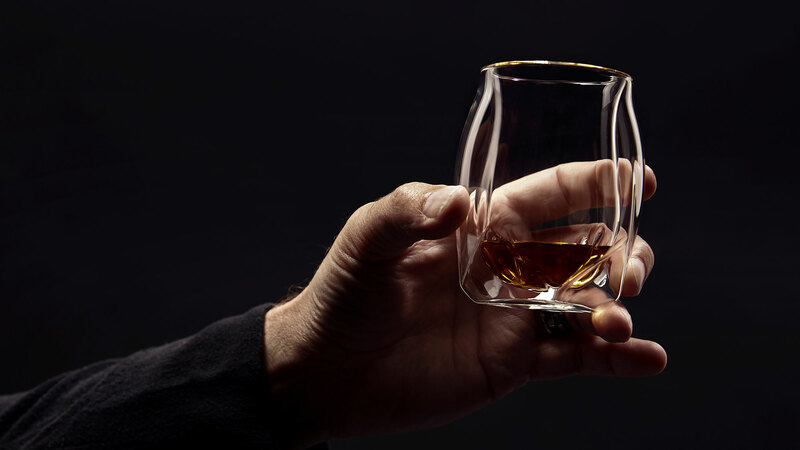 The glass was designed with the intention of enjoying whisky neat. Use of ice is not recommended. Not to be used with whisky stones as they can damage the inner wall. Do not place in a microwave or oven. The perfect synthesis of a tumbler form, with an exceptionally improved nosing glass performance. A modern, lightweight design featuring double-walled glass, combining a faceted base with a curved inner bowl. Specifically designed to allow you to inhale and drink the spirit without tilting your head back too deeply. Aerates better than any other glass, reducing ethanol intensity, requiring less water dilution for richer aromas. Focuses and diffuses the aromatics to the nose and mouth, revealing hidden flavors. Meticulously refined with master distiller Jim McEwan over the course of a four day workshop. Through specially developed protrusion forms inside the glass — adapted through studying bio-mimicry — when swirled around the glass the fluid forms a standing wave shape, which increases the surface to air ratio and rate of oxidization. The effect here is that considerably more ethanol evaporates. This resulting increase in volatility allows the whisky to become significantly more expressive. This feature is an invention of the Norlan glass — no other whisky glass will do this for you. The second main performance feature is the shape of the inner walls, which close as they rise and then flare out again so as not to hit the nose. The height and diameter of the smallest aperture focuses the aromatics to the nose while simultaneously diffusing the ethanol away from the face, fantastically improving the taste of your whisky. “Fifty-three years in this business and still there are some things that surprise you. This is the best glass I’ve ever used... Better than the glass I test my own whiskies with." The casual drinker and aficionado alike commonly enjoy whisky or bourbon in an “old- fashioned” tumbler, a wide open-brimmed glass intended for iced cocktails. Many connoisseurs prefer a narrower aperture of the brim, opting for a tasting (or nosing) glass—a stemmed tulip-shaped snifter that concentrates the aromas and allow for inspection of the spirit’s color without marking the glass’ bowl with fingerprints. We took these two preferences to heart and through an extensive process of analyzing fluid dynamics and flavor transfer, iterative design, and expert feedback, created an entirely new whisky glass. Nosing glasses often concentrate the shape of the vapor in such a way that they tightly focus it, causing the ethanol to punch into the eyes and nose. A significant downside to using a nosing glass is that it changes the drinking experience to an introspective process, whereby the head is tilted up and back, cutting the drinker off from his surroundings. A tumbler, on the other hand, allows one to sip while maintaining eye contact; a cool social glass. The social advantage of this is obvious, however the wide opening of the glass diffuses the aromatics of the spirit too widely, fading and flattening out the unique aromas of the spirit away from the nose—the drinker’s first and primary sensory point.